The 1948 World Series saw the Cleveland Indians against the Boston Braves. The Braves had won the National League pennant for the first time since the “Miracle Braves” team of 1914, while the Indians had spoiled a chance for the only all-Boston World Series by winning a one-game playoff against the Boston Red Sox for the American League flag. Though superstar pitcher Bob Feller failed to win either of his two starts, the Indians won the Series in six games to capture their second championship and their first since 1920 (as well as their last to the present date). The first game was played at Braves Field in Boston. 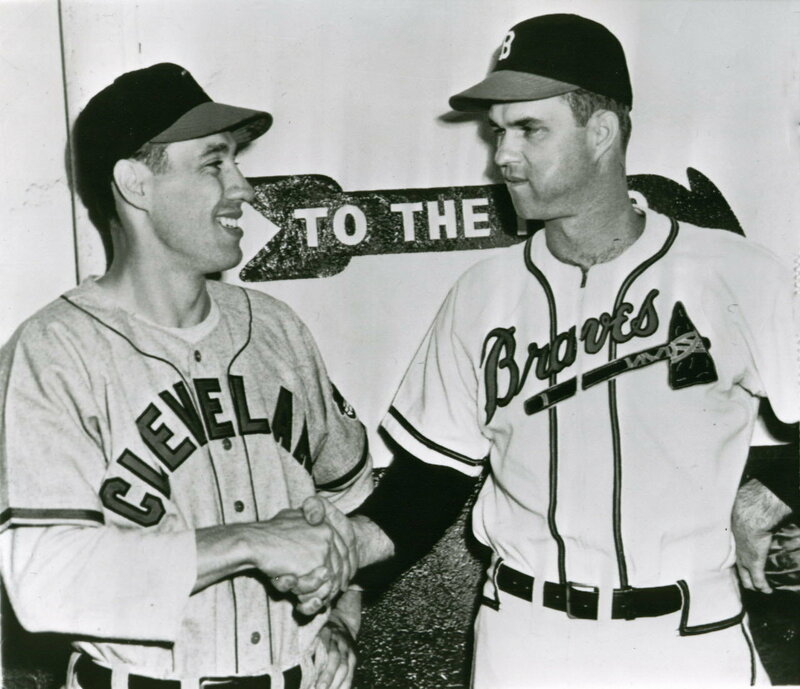 Braves pitcher Johnny Sain and Indians pitcher Bob Feller were engaged in a scoreless pitchers’ duel when the Braves came to bat in the bottom of the eighth inning. Feller walked Braves catcher Bill Salkeld to open the inning. Braves manager, Billy Southworth then replaced the slow-footed Salkeld with Phil Masi, who entered the game as a pinch runner. Mike McCormick followed with a sacrifice bunt, advancing Masi to second base. Feller issued an intentional walk to Eddie Stanky, who was replaced by Sibby Sisti. Feller then tried to pick off Masi at second base. Indians’ shortstop Lou Boudreau appeared to tag Masi out, but umpire Bill Stewart called him safe. Tommy Holmes proceeded to hit a single that allowed Masi to score the only run of the game, giving the Braves a 1–0 victory. The umpire’s controversial ruling touched off heated debates among the media and fans, especially after Associated Press photographs of the play were published. Although Feller allowed only two hits, he took the loss in what would be the closest he ever came to winning a World Series game. Upon his death in 1990, Masi’s will revealed that he really was out on the pick-off play.